When did you start speedsurfing and what was the reason the start? It is a long time ago I started windsurfing (1979). My first board was a Mistral competition PE (25kg), from the first moment it was speed what attracted me most in windsurfing. That was the moment speedsurfing started for me. It didn't took long before I entered triangle competitions, lateron with a roundbottom. This was in Anna Paulowna and with WSV Lutje on the Amstelmeer. I was even the club champion, really a great time. Sadly windsurfing got less populair after some time, you could buy a decent slalomboard anymore. According to Gerrit Kater there was no market anymore for those slalomboards. Speed was still my thing, I used slalom and freerideboards: Mistral Screamer, Edge, AHD 272, 260 and Naish titan. Tell me about your best speedsurfing day ever, what was it like? The real speedsurfing started during my first Ultimate Speed Meeting in 2006, I did 75km/h with the Fanatic Falcon 91 + North Warp. WOOWW that acceleration I will never forget, result 9th place overall. 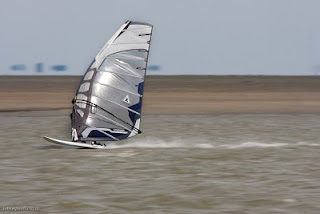 The best speedsurfing day in 2009 was also on Strand Horst, in a supergust I got a 78.5km/h on the GPS, it felt like a low 70, really easy. This year I am aiming for 80kmh/ topspeed, 74km/h AVG and also Mile/Alpha and hour should be improved. 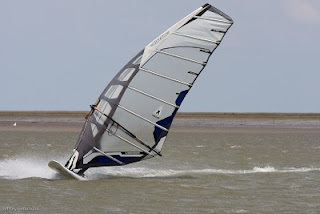 Enough windsurfing ambitions for an almost 50 yr old. What would you like to see from the R&D department of windsurfing, or does all gear suit your needs? 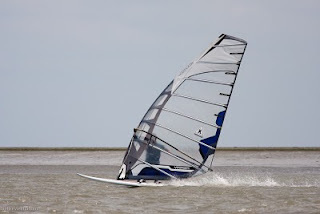 I would like to see more durable sails, real racing sails are not good anymore after 2 years good use, this is a general trend among all brands. This could be done better. I really hope fanatic finally puts a new speedboard on the market, I think they should have enough know-how to replace the current falcon speed model and make the new one quicker on all aspects. In 2010 you joined the Wad1team, I will try to do 50/50 (distance/speed), what is your idea? In 2010 I became a member and we will do our best to compete on worldwide level against other GPSTC teams. I think about 40%/60% distance/speed for the tean. We have a stong team with enough diversity to compete on all 6 points. What is your favorite gear at this moment? My favorite gear is the Fanatic Falcon Speed+ Neilpryde RS racing evo1 6.2+ Caspar Speed 25cm, next to this fast gear I think the new Fanatic Falcon 86+6.2 will do the job.